There are 50 shades of grey, and then some, in the colourful world of paint companies, each sounding infinitely more engaging and alluring than the movie was. They have names like Stone Harbour, Morning Shale, Cumulous Cloud, Down Pipe, Magnetic Grey, Distant Thunder and Anonymous. 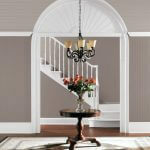 Who wouldn’t want the warm, inviting tones of CIL’s Sutton Place or Behr’s Evening Hush coating their bedroom walls? But some home decorating colours do trend from year to year, their inspiration derived from such diverse industries as automobile manufacturing and fashion. In identifying those hot hues, virtually every paint company annually designates a Colour of the Year—something to pique interest and hopefully drive new sales. Sometimes those tones are vibrant. Sometimes not. Last year Benjamin Moore selected “Simply White.” According to physics, a colour is visible light with a specific wavelength, so since white does not have specific wavelength, Benjamin Moore’s Colour of the Year technically wasn’t even a colour. But it was popular. And let’s not get technical. After all, these companies take their predictions very seriously—none more so than PPG. The company contracts an estimated 25 experts in varying industries worldwide—including aerospace, automotive, industrial, consumer electronics and architectural businesses—to help it identify upcoming colour trends for homes, not to mention electronic devices and automobiles. How quickly do these trends shift? Last year, violet tones represented a mere 1% of PPG paint sales. For its part, Sherwin-Williams’ Global Forecast Group is made up of seven colour specialists representing multiple countries and disciplines, including experts in architectural paint, product finishes and colour marketing. Their selection for 2017 also makes life easy for home decorators. 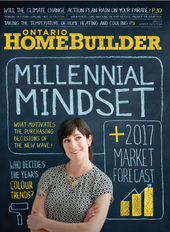 While Sico is on board with its parent company’s purple theme—selecting Mozart (a blue-grey violet tone) as the brand’s 2017 Colour of the Year—the Canadian company sees some cracks forming in the traditional play-it-safe approach to home paint. Lockhart also sees jewel tones in a big way for her 2017 collection—some of her inspiration derived from recent travels. “The most striking, memorable site has been modern furniture in jewel tones juxtaposed against crumbling, centuries-old brick walls,” Lockhart wrote from southern Spain. We can consequently expect jewel-toned colours (rich reds, deep greens, golden yellows) to frequent Lockhart’s collections of furniture and client work in the coming year. Sherwin-Williams’ Wadden echoes the sentiment. “While the typical models of faux finishing have been trending down over the last several years, we do see continued interest in metallic finishes,” Wadden says. “More important, it seems that consumers are looking for high-end paint products that deliver technology and innovation. For instance, our Paint Shield product is a revolutionary coating (that actually has the power to kill infectious bacteria). Another product that I love is our Snap Dry, a quick-dry, high-quality paint recommended for front doors (see sidebar). Which means Canadians probably won’t be seeing a Benjamin-Moore Trump Orange anytime soon.